The impetus of the American Silver Eagle bullion program ultimately comes from executive plans through the 1970s and early 1980s to sell off silver from the Defense National Stockpile. As the Wall Street Journal explained, "Several administrations had sought unsuccessfully to sell silver from the stockpile, arguing that domestic production of silver far exceeds strategic needs. But mining-state interests had opposed any sale, as had promilitary legislators who wanted assurances that the proceeds would be used to buy materials more urgently needed for the stockpile rather than merely to reduce the federal deficit." Throughout the period, such sell-offs that did occur, as well as announcements of planned sell-offs, caused immediate declines in the price of silver. The Wall Street Journal reported in September 1976, "When the US government makes noises about selling silver from the federal stockpile, futures traders start unloading futures contracts in speculation that such a sale would depress prices." Despite congressional opposition to the sale of stockpiled silver through early June 1981, the House Armed Services Committee decided on June 10 to approve a Reagan administration request to sell government-owned silver beginning in fiscal year 1982 to help balance the federal budget. In July 1981, the House and Senate agreed to allow the sale of 75% of the stockpiled silver (105.1 million troy ounces) over a three-year period, and in September the price of silver fell 11% in response. Just before the first sale in October 1981, a group of politicians from Idaho—a major silver-producing state—attempted to block the auction, claiming that the sale could have a "disastrous effect" on the United States silver mining industry in general and several Idaho silver mining companies in particular. On December 3, 1981, Senator James A. McClure (R-Idaho) proposed an amendment (S.UP.AMDT.738) to the Department of Defense appropriation bill (H.R. 4995) to end the government's sale of silver "until the President, not later than July 1, 1982, redetermines that the silver authorized for disposal is excess to the requirements of the stockpile." The appropriations bill was signed into law (Public Law 97-114) with the amendment intact, effectively stopping the further sale of stockpiled silver. On May 27, 1982, Senator McClure introduced bill S. 2598, "A bill to provide for the disposal of silver from the National Defense Stockpile through the issuance of silver coins," to "redirect the sale of silver from our national defense stockpile in an effort to minimize its affect [sic] on the already depressed price of silver." An identical companion bill, H.R. 6649, was introduced on June 22 by Representative Larry E. Craig (R-Idaho) but both bills were referred to committees and never were enacted. The Wall Street Journal reported on June 30 that the price of silver "soared after Interior Secretary James Watt announced that sales of the government's silver stockpile will be indefinitely postponed" as the government's legally required study on potential methods of selling the silver had been delayed. ... if we are forced to accept a sale, why use the method guaranteed to depress the price and dispose of the silver with the lowest possible return to the taxpayers[?] Why not instead, if we must sell, at least get as much for it as we can? Therefore, today, I am introducing legislation which provides that in the event the President proposes and Congress authorizes the sale of silver from the strategic stockpile, this silver would be sold through the minting and distribution of a silver-bearing coin. The bill was referred to the Committee on Banking, Housing, and Urban Affairs which held hearings on April 15, 1983, however, it was not enacted. Proposed on June 21, 1985, the Senate agreed to McClure's amendment by voice vote on the same day and it was added to H.R. 47; the House approved the amended bill three days later and it was signed into law by President Reagan on July 9, 1985. Thus, the authorizing law for the American Silver Eagle bullion program is Title II of Public Law 99-61 (Liberty Coin Act) codified as 31 U.S.C. § 5112(e)-(h). The authorizing legislation for the American Silver Eagle bullion program stipulated that the silver used to mint the coins be acquired from the Defense National Stockpile with the intent to deplete the stockpile's silver holdings slowly over several years. By 2002, it became apparent that the stockpile would be depleted and that further legislation would be required for the program to continue. On June 6, 2002, Senator Harry Reid (D-Nevada) introduced bill S. 2594, "Support of American Eagle Silver Bullion Program Act," "to authorize the Secretary of the Treasury to purchase silver on the open market when the silver stockpile is depleted." The bill was passed by the Senate on June 21 and by the House on June 27 and signed into law (Pub.L. 107–201, 116 Stat. 736) by President Bush on July 23, 2002. The first American Silver Eagle coin was struck in San Francisco on October 29, 1986. Secretary of the Treasury James A. Baker III presided over the striking ceremony held at the San Francisco Assay Office. According to a Chicago Sun-Times article, as Baker "reached for the electronic button on press No. 105, he turned to the audience and said, 'I don't need a pick and shovel to start the San Francisco Silver Rush of 1986.'" Bullion Silver Eagle coins do not have mintmarks. From 1986 to 1998, they were produced at the San Francisco Mint. From 1999 to 2000, they were produced at the Philadelphia Mint and West Point Mint. In March 2011, the San Francisco Mint conducted trial strikes of bullion Silver Eagle coins in preparation for the resumption of full production later in the spring. The added production capacity provided by the San Francisco Mint supplements the output of the West Point Mint. From 1986 to 1992, proof Silver Eagle coins were minted at San Francisco and these coins bear the "S" mintmark. From 1993 to 2000, they were minted at Philadelphia and these coins bear the "P" mintmark. From 2001 to 2008, they were minted at West Point and these coins bear the "W" mintmark. No proof versions were minted in 2009. Beginning again in 2010, the proof coins were minted at West Point and bear the "W" mintmark. 2016-2017 West Point, San Francisco, and Philadelphia all minted American Silver Eagles with the majority being at West Point. This was found out by the tracking numbers on the monster boxes and through the freedom of information act. None in 2015 were minted at San Francisco mint. A very small number were minted at San Francisco and Philadelphia in 2016-2017. From 2006 to 2008 and beginning again in 2011, the United States Mint issued a collectible uncirculated Silver Eagle coin produced at West Point (bearing the "W" mintmark). The coins are struck on specially burnished blanks and sometimes are referred to as "W Uncirculated" or "Burnished Uncirculated." Aside from the standard-issue burnished Eagles, there has been one burnished Eagle issue produced at San Francisco bearing the "S" mintmark for release in the "American Eagle 25th Anniversary Silver Coin Set" in 2011. In 1993, the "Philadelphia Set" was issued to commemorate the bicentennial of the striking of the first official United States coins at the Philadelphia Mint in 1793. The set included proof American Gold Eagle coins in 1/2 ozt, 1/4 ozt, and 1/10 ozt sizes, a proof Silver Eagle coin, and a 90% silver proof "U.S. Mint Bicentennial" medal, all with "P" mintmarks. In 1995, in addition to the regular proof coin minted at Philadelphia, the United States Mint also issued a proof coin minted at West Point. Known as the "1995-W Proof Silver Eagle," the coin was sold only as part of the "10th Anniversary American Eagle Five Coin Set" which also included the four 1995-W proof American Gold Eagle coins in 1 ozt, 1/2 ozt, 1/4 ozt, and 1/10 ozt sizes; 30,125 sets were sold. In 2000, the Mint issued the "United States Millennium Coinage and Currency Set" which included a 2000 Silver Eagle bullion coin minted at West Point (but without a "W" mintmark), a 2000 Denver-minted Sacagawea Dollar with a burnished finish, and an uncirculated 1999 series one-dollar bill with a serial number beginning with the numbers "2000". The sets sold out at the issue limit of 75,000 units. In fewer than twenty known sets, the Sacagawea Dollars do not have a burnished finish. Cover of the "Legacies of Freedom United States and United Kingdom Silver Bullion Coin Set". In January 2004, the Mint issued the "Legacies of Freedom United States and United Kingdom Silver Bullion Coin Set" which consisted of a 2003 bullion Silver Eagle and a 2002 Silver Britannia bullion coin from the United Kingdom. The set had an issue limit of 50,000. To celebrate the 20th anniversary of the American Silver Eagle program in 2006, the Mint issued a special "Reverse Proof Silver Eagle" coin minted at Philadelphia. This coin was available as part of a 3-coin set which also included the regular proof coin and the new "Burnished Uncirculated" coin. The reverse proof coin features a frosted background and mirrored raised surfaces (the opposite of a typical proof coin of the series). Uncirculated Silver Eagle coins also were available as part of the "20th Anniversary Gold & Silver Eagle Set" which had an issue limit of 20,000 (19,145 were sold) and included the one-ounce, 2006-W uncirculated American Gold Eagle. The 2007 "United States Mint Annual Uncirculated Dollar Coin Set" with a Silver Eagle coin surrounded by Presidential and Sacagawea dollars. In 2007 and 2008, uncirculated Silver Eagle coins were packaged with each year's issues of Philadelphia-minted Presidential Dollars and Denver-minted Sacagawea Dollars in an "Annual Uncirculated Dollar Coin Set." The 2007 set became available directly from the Mint on December 3, 2007; the 2008 set was available from August 7, 2008 to January 28, 2010. In 2011, the Mint issued an "American Eagle 25th Anniversary Silver Coin Set" to celebrate the program's 25th anniversary. The set includes five coins in a lacquered presentation case: one proof coin minted at West Point, one uncirculated coin minted at West Point, one uncirculated coin minted at San Francisco, one reverse proof coin (frosted background with polished, mirror-like design elements/foreground) minted at Philadelphia, and one bullion coin. In June 2012, the Mint issued the "San Francisco American Silver Eagle Two Coin Proof Set" to commemorate the San Francisco Mint's 75th anniversary. The set includes a 2012 proof Silver Eagle coin and a 2012-S reverse proof Silver Eagle coin, both minted in San Francisco. In August 2012, the Mint issued the "Making American History Coin and Currency Set" which includes a 2012 proof Silver Eagle coin (minted in San Francisco) and a Series 2009 five-dollar bill with serial numbers beginning with "150". The set celebrates the Mint's 220th anniversary and the Bureau of Engraving and Printing's 150th anniversary. In November 2012, the Mint offered for sale the "2012 United States Mint Limited Edition Silver Proof Set" which includes a 2012 proof Silver Eagle coin (minted at West Point), five proof 90% silver quarters from the America the Beautiful Quarters program (minted in San Francisco), one 90% silver Kennedy half dollar (minted in San Francisco), and one 90% silver Roosevelt dime (minted in San Francisco). In May 2013, the Mint offered for sale the "2013 American Eagle West Point Two-Coin Set" which includes two 2013 Silver Eagle coins minted at West Point: a reverse proof coin and an uncirculated coin enhanced with three finishes (heavy frost, light frost, and brilliant polish). In 2016, the Mint issued "30th Anniversary" editions of the coin to celebrate the program's 30th anniversary. The coins were produced in both proof and uncirculated versions, and feature a special rim design with the inscription “30th ANNIVERSARY” incused on the edge of the coin, replacing the normal reeded edge. Proof versions went on sale in September 2016, uncirculated versions followed in December. Both were minted at West Point, NY, and bear the "W" mint mark. The first significant variety of the Silver Eagle series appeared in 2008 and is known as the "2008-W Silver Eagle Reverse of 2007 Variety." The United States Mint made slight alterations to the reverse design between 2007 and 2008 and some 2008 uncirculated coins inadvertently were struck with the 2007 reverse type die resulting in a die error. The variety is distinguishable by differences in the "U" in UNITED STATES and the dash between SILVER and ONE. As a result of the global recession, the demand from investors for bullion coins as a hedge against inflation and economic downturn surged. This increased demand began to affect the availability of American Silver Eagle bullion coins in February 2008 when sales to authorized dealers were suspended temporarily. In March 2008, sales increased ninefold from the month before (from 200,000 to 1,855,000). In April 2008, the United States Mint began an allocation program, effectively rationing Silver Eagle bullion coins to authorized dealers on a weekly basis due to "unprecedented demand." At least one observer has questioned the legality of the allocation program, as the Treasurer of the United States is required by law (31 U.S.C. § 5112(e)) to mint and issue these coins "in quantities sufficient to meet public demand." On June 6, 2008, the Mint announced that all incoming silver planchets were being used to produce only bullion issues of the Silver Eagle and not proof or uncirculated collectible issues. The 2008 Proof Silver Eagle became unavailable for purchase from the United States Mint in August 2008 and the 2008 Uncirculated Silver Eagle sold out in January 2009 (however, it was available as part of the "2008 Annual Uncirculated Dollar Coin Set" until it sold out on January 28, 2010). On March 5, 2009, the United States Mint announced that the proof and uncirculated versions of the Silver Eagle coin for that year were temporarily suspended due to continuing high demand for the bullion version. The allocation program that had been put in place in March 2008 was lifted on June 15, 2009, leading to speculation that proof and uncirculated versions might be produced before the end of the year. However, on October 6, 2009, the Mint announced that the collectible versions of the Silver Eagle coin would not be produced for 2009. The disappointment of collectors was expressed in a December 1 article by Representative Gary C. Peters (D-Michigan). Peters offered alternative scenarios to the cancellation of 2009 proof and uncirculated Silver Eagles and explained that he would be sending a letter to Mint Director Edmund C. Moy urging him to begin minting these products as soon as possible and continuing to do so until the end of the year. This effort was not successful and the collectible versions were not produced. The sale of 2009 Silver Eagle bullion coins was suspended from November 24 to December 6 and the allocation program was re-instituted on December 7; the product sold out on January 12, 2010. Production of the 2010 Silver Eagle bullion coins began in January of that year (as opposed to beginning typically in December preceding the year of issue) and the coins were distributed to authorized dealers under an allocation program until September 3. ... [B]ecause we could not produce these popular coin products, those who had become accustomed to purchasing them on an annual basis were very disappointed. As Director of the United States Mint, I appreciate the disappointment of these collectors, but I am encouraged to know that the Subcommittee is exploring the possibility of an amendment to the law that would afford the Secretary the authority to approve the minting and issuance of American Eagle Silver Proof and Uncirculated Coins even when we are unable to meet the public's demand for the bullion versions of these coins. American Eagle coin collectors and our many other customers who purchase these products as gifts would likely welcome such a change. Indeed, such a change would be one of the most positive customer satisfaction measures that could be taken to benefit your coin collecting constituents without having an effect on American's [sic] ability to acquire investment-grade silver bullion. We have already provided you technical drafting assistance that your staff have requested to accomplish this change; however, such a change needs to be enacted soon. We can mint 200,000 per month, and if we can begin by September, we will be able to produce about 830,000 one-ounce silver American Eagle coins to meet collector demand for this product in the remaining months of 2010. On September 22, 2010, Representative Melvin L. Watt (D-North Carolina) introduced the "Coin Modernization, Oversight, and Continuity Act of 2010" (H.R. 6162) to amend 31 U.S.C. § 5112 (e) and (i) by giving the Secretary of the Treasury authority to mint American Eagle silver and gold coins in "qualities [e.g. bullion, proof, or uncirculated] and quantities" sufficient to meet public demand. The bill was signed into law (Pub.L. 111–302) by President Barack Obama on December 14, 2010. On October 4, 2010, the Mint announced that 2010-dated proof American Silver Eagle coins would be available for purchase beginning on November 19, 2010, at a price of $45.95 per coin and that 2010-dated uncirculated Silver Eagle coins would not be produced. In January 2013, the Mint suspended sales of American Silver Eagle bullion coins after the first week due to high demand. The Mint resumed the allocation program that had been implemented from 2008 to 2010. In recent years, strong international demand for American Silver Eagles has materialized, especially in Asian markets. Markets such as Hong Kong, Singapore and even China are becoming trading hubs with transparent bid and ask spreads. Bullion 1986–2010: "Final Figures for American Eagle Bullion (in pieces)". United States Mint. Archived from the original on 5 June 2011. Retrieved April 23, 2011. 1995-W, 2011–2014: Yeoman, Richard S. (2016). Bressett, Kenneth (ed.). The Official Red Book: A Guide Book of United States Coins: 2017 (70 ed.). Atlanta: Whitman Publishing. ISBN 978-0-7948-43854. 2015–2016: "Silver Eagle Mintage". Silver Eagle Guide. Retrieved September 12, 2018. 2017: "U.S. Mint's bullion coin sales remain in a slump". Coin World. Retrieved 2018-09-12. Sales of American Silver Eagle bullion coins began on November 24, 1986, and initial inventories sold out "immediately due to the phenomenal demand." Silver Eagle bullion coins, along with American Gold Eagle bullion coins, were planned as "viable investment alternatives to the gold and silver bullion coins produced by other countries. ..." To ensure wide distribution of the coins, the United States Mint awarded a contract to Grey Advertising to assist in marketing and publicizing the coins domestically and internationally. Advertising efforts were expanded in fiscal years 1987 and 1988. 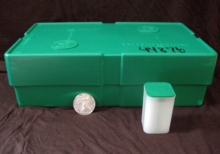 A green plastic box used by the United States Mint for shipping American Silver Eagle bullion coins. Each "monster box" holds 25 smaller plastic tubes (shown) which hold 20 coins each for a total of 500 coins. Authorized purchasers must order a minimum of 25,000 coins which they sell to secondary retailers that sell them, in turn, to the public. When sales of Silver Eagle bullion coins began in November 1986, the Mint had approved twenty-eight authorized purchasers to market the coins throughout the world. Bullion coins are shipped in so-called "monster boxes." Each green plastic box holds 500 coins which are packaged in 20-coin plastic tubes. On the lid of each box are two raised Department of the Treasury seals and the phrase "United States Mint" in raised lettering. Before shipping, the boxes are sealed with straps by the Mint and labeled with the year of issue and a serial number. Proof American Silver Eagle coins dated 1986 through 2008 were sold directly to the public by the United States Mint at a fixed price. The coins were packaged in a protective plastic capsule mounted in a satin-lined, velvet-covered presentation case and accompanied by a certificate of authenticity. Proof Silver Eagle coins first became available through the United States Mint's subscription program in October 2002. Uncirculated coins dated 2006 through 2008 were sold directly to the public by the United States Mint in packaging similar to that of the proof coins; however, the 2006 coin's capsule was housed in a velvet drawstring bag. Special issues and sets are sold directly to the public by the United States Mint. American Silver Eagle bullion coins carry a face value of US$1. This is their legal value reflecting their issue and monetization as coins. Per 31 U.S.C. § 5112(h), the coins are legal tender for all debts public and private at their face value. This value does not reflect their intrinsic value which is much greater and is dictated by their silver content and the metal's spot price. Mintages, and thus prices, of bullion, proof, and uncirculated Silver Eagle coins have varied widely, and the potential collector is advised to check a standard reference book before buying them. Generally, the bullion versions have been minted in the millions, while the proof and uncirculated versions were issued in the hundreds of thousands each. Most dates of the bullion issue are not particularly expensive (around $25 as of September 2016) and are traded at a premium above the intrinsic value of the silver they contain; most proof versions (around $65–$75 as of 2016) and uncirculated versions (around $25–$75 as of 2016) sell for more. Some issues sell for significant sums, for example the 1995-W proof ($3,800 as of 2016) and the 2006 20th anniversary set containing a special "Reverse Proof" coin along with a regular proof coin and the new "Burnished Uncirculated" coin ($250 as of 2016). This article incorporates public domain material from websites or documents of the Internal Revenue Service. This article incorporates public domain material from websites or documents of the United States Congress. This article incorporates public domain material from websites or documents of the United States Mint. ^ "Publication 590-A: Contributions to Individual Retirement Arrangements (IRAs)" (PDF). United States Department of the Treasury, Internal Revenue Service. January 13, 2015. p. 34. Archived (PDF) from the original on May 5, 2015. Retrieved May 20, 2015. ^ a b "United States Mint Offers New 'Legacies of Freedom' Set". United States Mint. January 20, 2004. Retrieved March 25, 2010. ^ a b "Government to Sell 75% of Its Silver Stockpile". Wall Street Journal. July 24, 1981. ^ "Congress Asked to Clear Sales from Stockpile: Carter Administration Seeks Authority to Sell Silver, Tin, Other Commodities". Wall Street Journal. March 6, 1978. ^ "Nixon Plan to Sell Stockpiled Commodities Could Be Slowed by Market, Legal Snags". Wall Street Journal. March 16, 1973. ^ Jackewicz, Shirley A. (September 10, 1976). "Possible Silver Stockpile Sale Seen as Bullish for Market in Long Run". Wall Street Journal. ^ "House Committee Rejects Sales of Silver from Government's Strategic Stockpile". Wall Street Journal. September 12, 1979. ^ "House Refuses to Sell Any Silver in U.S. Stockpile: Compromise That Called for Sale of 5 Million Ounces Loses by Lopsided Margin". Wall Street Journal. December 13, 1979. ^ "House Panel Rejects Reagan Bid to Sell All of Silver in Stockpile". Wall Street Journal. June 5, 1981. ^ "Big U.S. Silver Sale Is Likely as Congress Reconciles Budget". Wall Street Journal. June 15, 1981. ^ Lowenstein, Roger (September 18, 1981). "U.S. Plan to Sell Silver from Its Stockpile Depresses Metal's Price 11%; Gold Drops". Wall Street Journal. ^ "Idaho Officials Protest GSA's Plans for Sale of Stockpiled Silver". Wall Street Journal. October 14, 1981. ^ Twight, Charlotte (1989). "The Political Economy of the National Defense Stockpile". Policy Studies Review. 8 (4): 778. ^ National Security Silver Disposal Act of 1982, S. 2598, 97th Cong., 2d sess., Congressional Record 128, pt. 9:12321. ^ "Silver Price Soars After U.S. Postpones Sales of Stockpile". Wall Street Journal. June 30, 1982. ^ National Security Silver Disposal Act of 1983, S. 269, 98th Cong., 1st sess., Congressional Record 129, pt. 1:1050. ^ Senate Committee on Banking, Housing, and Urban Affairs, Gold and Silver Coinage Proposals: Hearing Before the Committee on Banking, Housing, and Urban Affairs, United States Senate, Ninety-Eighth Congress, First Session, on S. 42 "To Provide for the Minting of American Gold Eagle Coins Pursuant to Article 1, Section 8 of the United States Constitution" and S. 269 "To Provide for the Disposal of Silver from the National Defense Stockpile through the Issuance of Silver Coins," 98th Cong., 1st sess., April 15, 1983. ^ Amendment no. 418, 99th Cong., 1st sess., Congressional Record 131, pt. 12:16799-16800. ^ "U.S. to Offer $1 Silver Coin". The New York Times. October 30, 1986. ^ Rochette, Ed (December 28, 1986). "Sales Start Slowly for the New Silver Eagle Dollars". Chicago Sun-Times. ^ Gilkes, Paul (March 28, 2011). "San Francisco Mint to Strike Silver Bullion". Coin World. ^ "United States Mint to Begin Taking Orders for American Eagle Silver Bullion Coins at its San Francisco Facility" (Press release). United States Mint. May 26, 2011. Retrieved May 27, 2011. ^ a b Yeoman, Richard S. (2016). Bressett, Kenneth (ed.). The Official Red Book: A Guide Book of United States Coins: 2017 (70 ed.). Atlanta: Whitman Publishing. ISBN 978-0-7948-43854. ^ "The American Eagle Silver Coin: History, Design, Prices and Mint Figures". Coin News Media Group. Archived from the original on 5 January 2010. Retrieved January 30, 2010. ^ 1993 Annual Report. Washington, D.C.: United States Mint. p. 26. ^ "1995-W Proof Silver Eagle". Silver Eagle Guide. Archived from the original on 28 December 2009. Retrieved January 10, 2010. . The 1995-W Proof Silver Eagle is considered the key to the Proof series, due to the low mintage and ability to only purchase with the Proof Gold Eagle set. ^ "2000 Silver Eagle". Silver Eagle Guide. Archived from the original on 5 February 2010. Retrieved March 21, 2010. ^ "The 2000-D Sacagawea Dollar From The United States Millennium Coinage & Currency Sets". SmallDollars.com. Retrieved March 21, 2010. ^ "20th Anniversary Silver Eagle Set". Silver Eagle Guide. Retrieved January 10, 2010. ^ "U.S. Mint Online Product Catalog: 2007 United States Mint Annual Uncirculated Dollar Coin Set (XA1)". United States Mint. Archived from the original on 2010-08-13. Retrieved March 14, 2010. ^ "U.S. Mint Online Product Catalog: 2008 United States Mint Annual Uncirculated Dollar Coin Set (XA2)". United States Mint. Archived from the original on 4 February 2010. Retrieved March 14, 2010. ^ Zielinski, Michael (January 29, 2010). "2008 United States Mint Annual Uncirculated Dollar Set Sold Out". Mint News Blog. Archived from the original on 2 February 2010. Retrieved March 14, 2010. ^ "United States Mint Announces Plans to Issue American Eagle 25th Anniversary Silver Coin Set" (Press release). United States Mint. August 19, 2011. Retrieved October 13, 2011. ^ Zielkinski, Michael (April 27, 2012). "2012 San Francisco Silver Eagle Two Coin Set". Mint News Blog. Retrieved April 30, 2012. 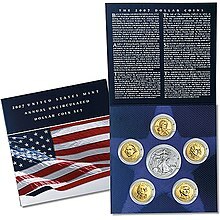 ^ "Making American History Coin and Currency Set (TA8)". U.S. Mint Online Product Catalog. Archived from the original on August 7, 2012. Retrieved August 6, 2012. ^ "2012 United States Mint Limited Edition Silver Proof Set (LS1)". U.S. Mint Online Product Catalog. Archived from the original on November 24, 2012. Retrieved November 24, 2012. ^ Roach, Steve (April 3, 2013). "Enhanced Uncirculated American Eagle Complicates Series". Coin World. Archived from the original on April 9, 2013. Retrieved April 8, 2013. ^ "2013 American Eagle West Point Two-Coin Silver Set (S40)". U.S. Mint Online Product Catalog. Archived from the original on April 14, 2013. Retrieved April 14, 2013. ^ "2008-W Silver Eagle Reverse of 2007 Variety". Silver Eagle Guide. Archived from the original on 28 December 2009. Retrieved January 10, 2010. ^ a b c Dugan, Ianthe Jeanne (May 23, 2008). "Losing a Mint: Curb on Coin Sales Angers Collectors". Wall Street Journal. Archived from the original on 12 January 2010. Retrieved January 12, 2010. ^ "2008 American Eagle Bullion Sales Totals". United States Mint. Retrieved January 12, 2010. ^ Weir, Bix (June 4, 2008). "US Silver Eagles Illegally Rationed". Silver Seek. Archived from the original on 2008-06-05. Retrieved January 12, 2010. ^ Zielinski, Michael (August 29, 2008). "2008 Proof Silver Eagles Not Available". Mint News Blog. Retrieved January 12, 2010. ^ Zielinski, Michael (January 29, 2010). "2008 United States Mint Annual Uncirculated Dollar Set Sold Out". Mint News Blog. Archived from the original on 2 February 2010. Retrieved January 29, 2010. ^ Zielinski, Michael (March 6, 2009). "2009-W Proof & Uncirculated Silver Eagle Availability". Mint News Blog. Retrieved January 12, 2010. ^ Zielinski, Michael (June 16, 2009). "Gold and Silver Eagle Bullion Allocation Programs End". Mint News Blog. Retrieved January 12, 2010. ^ "United States Mint to Offer 2009 American Buffalo Proof Gold and American Eagle Platinum Proof Coins: Agency Also Announces Products not Offered in 2009". United States Mint. October 6, 2009. Archived from the original on 6 January 2010. Retrieved January 12, 2010. ^ Peters, Gary (December 1, 2009). "Legislator Urges Mint to Coin Proof Eagles". Numismatic News. Retrieved January 12, 2010. ^ Unser, Mike (January 12, 2010). "US Mint 2009 Silver Eagles Sell Out". Coin News. Archived from the original on 16 January 2010. Retrieved January 13, 2010. ^ Zielinski, Michael (January 8, 2010). "2010 Gold and Silver Eagle Bullion". Mint News Blog. Archived from the original on 12 January 2010. Retrieved January 12, 2010. ^ "Rationing Ends for Silver Eagles". Numismatic News. September 10, 2010. Retrieved September 11, 2010. ^ United States House Financial Services Subcommittee on Domestic Monetary Policy and Technology (2010). The State of U.S. Coins and Currency: Hearing before the Subcommittee on Domestic Monetary Policy and Technology of the Committee on Financial Services, U.S. House of Representatives, One Hundred Eleventh Congress, Second Session, July 20, 2010 (PDF). Serial No. 111–145. Washington: U.S. Government Printing Office. pp. 90–91. Archived (PDF) from the original on 2 December 2010. Retrieved November 30, 2010. ^ "U.S. Mint Price of Silver Proof Coin". United States Mint. November 19, 2010. ^ "United States Mint to Offer American Eagle Proof Coins: One-Ounce Silver Proof Coins to Go on Sale November 19th". United States Mint. October 4, 2010. Archived from the original on 6 October 2010. Retrieved October 4, 2010. ^ "US Mint Runs Out of 2013 Silver Coin". ABC News. January 19, 2013. Retrieved January 19, 2013. ^ Zielinski, Michael (January 18, 2013). "The Return of Silver Eagle Rationing". Mint News Blog. Retrieved January 19, 2013. ^ CNBC. "Wires". CNBC. Retrieved 17 April 2018. ^ "Buy US Silver Online - Silver | LPM". www.lpm.hk. Retrieved 2017-10-14. ^ 1987 Annual Report. Washington, D.C.: United States Mint. p. 5. ^ 1986 Annual Report. Washington, D.C.: United States Mint. pp. 9–10. ^ 1987 Annual Report. Washington, D.C.: United States Mint. p. 10. ^ 1988 Annual Report. Washington, D.C.: United States Mint. p. 4. ^ "American Eagle Bullion Coins for Investors". United States Mint. Archived from the original on 13 April 2010. Retrieved March 19, 2010. ^ Zielinski, Michael (October 1, 2010). 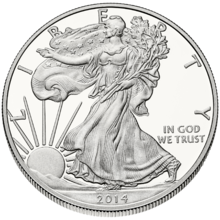 "US Mint Raises Premiums for American Silver Eagles". Coin Update News. Archived from the original on 3 October 2010. Retrieved October 3, 2010. ^ a b "American Eagle Bullion Coins". United States Mint. Retrieved March 19, 2010. ^ 1987 Annual Report. Washington, D.C.: United States Mint. p. 9. ^ "Silver Eagle Green Monster Box". Silver Eagle Guide. Archived from the original on 2 April 2010. Retrieved March 19, 2010. ^ "American Eagle Proof Coins for Collectors". United States Mint. Archived from the original on 21 April 2010. Retrieved March 19, 2010. ^ "2002 Annual Report" (PDF). United States Mint. p. 10. Retrieved March 14, 2010. Mercanti, John (2012). American Silver Eagles: A Guide to the U.S. Bullion Coin Program. Whitman Publishing. ISBN 978-0794837259. 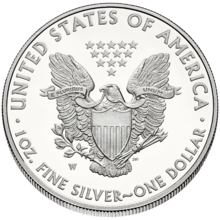 Wikimedia Commons has media related to American Silver Eagle.